I finally started working on my second version of BWOF 5-2008-113, the easy chic, safari-ish, trench-y dress. My inspiration for this version comes from the website of one of my favorite jewelry designers, Kimberly Baker (she's local to me, so I go to browse her wonderful shop every now and then). Unfortunately I don't know who the dress designer is, but I love how there is a bright yellow piece that peeks out from inside the model's sleeve. 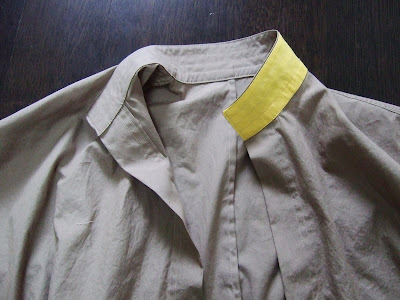 For the fashion fabric of my dress, I'm using a really great khaki cotton poplin, it almost has a sheen to it. I found the yellow contrast fabric in the quilting cottons section, it was the only place I could find the right color. I'll be doing the undercollar, the underside of the pocket flaps, and the long skinny button band in the yellow (I got more of those sliding buttons). I'm off to watch Project Runway. I forgot it was on last night! Thank goodness for digital recorders. I love the touch of yellow, it makes it distinctively your own! I can't wait to see the finished dress! Christina your topstiching is really impressive!! My jaw dropped when the large pic loaded, LOL. Love that yellow too, I see what you mean about finding the right tone. Is that a french seam in the back? Love that color combination. Can't wait to see the finished piece!!! the yellow is a great detail! That is a great idea puting that touch of color to the pattern! The yellow is a great choice. love Yellow with Khaki. What a great eye you have. love the jewellery by Kimberley Baker too.